Abby Johnson sees an abortion for the first time. 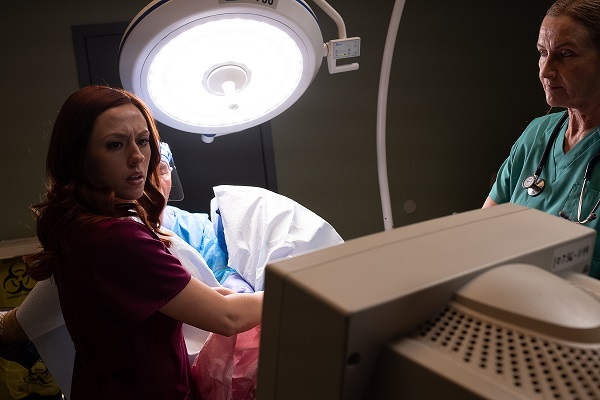 Unplanned  tells the story of Abby Johnson, who almost on a lark volunteers to help Planned Parenthood’s supposed mission to reduce abortions and rises to become the director of a Planned Parenthood (PP) clinic. She’s a rising star at PP until she’s confronted with the truth of what abortion actually does. Perhaps what this movie does best is expose all the lies Planned Parenthood promotes from the “we’re primarily a women’s healthcare facility” to what Abby initially foolishly believes – that the mission of PP is to reduce abortions. The abortion industry is full of lies of both commission and omission. This movie does a good job of exposing them all. The movie is also educational without being overtly academic about it. Embedded in the movie are descriptions of the various types of abortions – with varying degrees of graphical depiction . So a pair of popular lie that Planned parenthood likes to convey to desperate young women still early in their pregnancy – that it’s just “a clump of cells” and “at this stage they’ll feel no pain” are exposed for what they are – outright unmitigated lethal lies. A couple of a number of lies that are exposed. But what I like best about the movie is that it has something to say to everyone – whether you’re pro-life or pro-choice even up to infanticide – this movie has a powerful message to you: a message of grace and humility. To the pro-lifers – how to humble yourself and show grace to those you disagree with. To the pro-choicers still caught in the lie that’s “it’s my body” (so my choice) and abortions are relatively risk-free: how to reign in the self righteous arrogance, try a little humility, look at the truth and accept grace from those you think are enemies. And even better – how to give grace to your unborn child – a child whose body is separate and distinct from you the mother. A child who is a tiny human who is at the mercy of you the mother to allow that tiny body to live. It even has a message for those currently in an “unplanned” pregnancy situation – a message of hope, a place to turn to. Need help right now? Text “Hope” to 73075. So yes, the movie has a message for everyone. So I give this film an unqualified thumbs up: you need to see this film. Whatever your position on abortion, there’s something you can learn. If not about abortion, then perhaps about yourself – are you lying to yourself as Abby was? This entry was posted in Abortion, Reviews by Duane Caldwell. Bookmark the permalink.